In her late 20s, Amber Tamblyn experienced a crisis of character while trying to break out of the confines of the acting career she'd forged as a child in order to become the writer and director she dreamed of being as an adult. After a particularly low period fueled by rejection and disillusionment, she grabbed hold of her own destiny and entered into what she calls an Era of Ignition --- namely, the time of self-reflection that follows in the wake of personal upheaval and leads to a call to action and positive change. In the process of undergoing this metaphysical metamorphosis, she realized that our country was going through an Era of Ignition of its own. She writes: "No longer stuck in a past we can't outrun and a future we must outgrow, we are a nation that is actively confronting our values and agitating for change. We are in an age when activism becomes direct action, when disagreement becomes dissention, when dissatisfaction becomes protest, when accusations become accountability, and when revolts become revolutions." Through her fierce op-eds and tireless work as one of the founders of the Time's Up organization, Amber has emerged as a bold, outspoken and respected advocate for women's rights. In ERA OF IGNITION, she addresses gender inequality and the judgment paradigm, misogyny and discrimination, trauma and the veiled complexities of consent, white feminism and pay parity, reproductive rights and sexual assault --- all told through the very personal lens of her own experiences, as well as those of her Sisters in Solidarity. 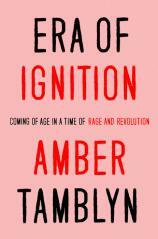 At once an intimate meditation and public reckoning, ERA OF IGNITION is a galvanizing feminist manifesto that is required reading for everyone attempting to understand the world we live in and help change it for the better.